The arch D was buzzing at the Pitching Event for the Social Impact Start award. 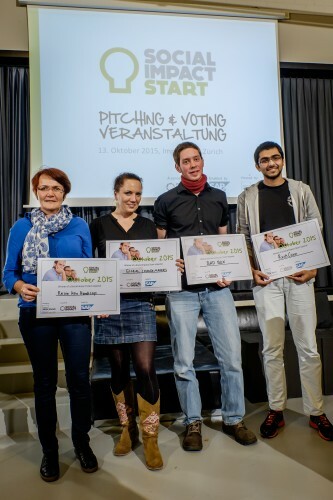 Eight projects presented their social startup idea on how to change the world for better. The jury chose four winners which will be supported 4-8 months and work from the Impact Hub to further develop their ideas. 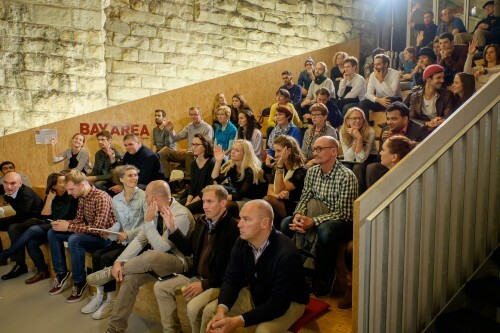 60 interested visitors came to hear the pitches and vote for their favorite idea to win the audience award. BioBox is a biodegradable container for safely containing hazardous biological waste. It will be used to contain faeces for innovative Container-Based Sanitation services which are delivering safe sanitation to un-served communities in slums across the world. Current containers used are just standard containers and have a number of problems around: smell control, safety, usability, and economic viability. Reisen kein Handicap offers support during travelling for handicapped and elderly people. They make vacations possible by providing the planning and hands-on support during travelling from basic help up to medical care. Different offers make it possible for different target groups enjoy vactions with Reisen kein Handicap. Global Changemakers brings together young people (16-25) at regional and global summits for capacity building workshops. After attending our workshops, the youth can apply for grants and mentoring to run their own projects and initiatives. The youth in the network are implementing projects and initiatives that bring about positive social and environmental change. India does have 2-G network connectivity in villages and world has great online education content. But 2-G internet is insufficient to stream most of the online educational to rural schools esp. video lectures. RustiConn breaks the multimedia content into small parts and provides special modem which will download the small parts of the lecture in parallel. Thus internet speed will be quadrupled. Congratulations to all the winners and their innovative solutions for social challenges. We look forward to having you in our community!